The last time I had to write a paper for a class was…hmm…a long time ago. 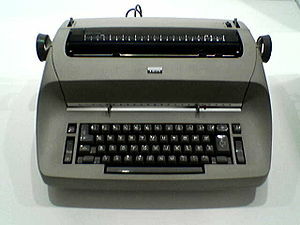 All I can say is the last time I wrote a paper, 300 BAUD modems were the gizmos the cool kids had, and I wrote my paper using an IBM Selectric typewriter borrowed from a friend. When I needed to do research, I trudged to McHenry Library, through the redwoods on the U.C. Santa Cruz campus, catching the bus home late at night. But now, I’m taking a class at the University of North Carolina, through the Certificate in Public Health program. It has been a long time since I have taken university level courses, and this is the first time I have taken a university level course entirely online. Suffice it to say, it is remarkably different from school as I remember it. I’ve been able to do a complete paper, including a great deal of research from the UNC Health Sciences library while sitting in a chair in my kitchen. Even with twenty-plus years experience in information technology, it has been a challenging yet thrilling to learn the mysterious methods of the modern student, surfing my way through PubMed, downloading articles, and sending citations flying through cyberspace. As difficult as it has been for me to figure out, it truly is remarkable technology, like having the Great Library of Alexandria at your fingertips, a click away from scholars and fellow students. I don’t know that an online education can truly replace in-class learning. There will always be a need for horny eighteen year old kids to find themselves without parental supervision, under the guise of getting a university education. Online education can’t replace meeting a girl or guy over coffee and a heated discussion of Proust, after all. But t is truly awe-inspiring to think of the broader horizons available to students — whether young, old, disabled, or just too busy to leave the farm — through electronic education. I’m barely rested after completing a short paper that was due last Sunday, my excuse for skipping a week in the WordPress Postaweek2011 challenge. I’m a little behind in my class reading, an online discussion topic started earlier in the week is probably starting to heat up, and I need to finish up a short quiz. School ain’t what it used to be; it’s a whole lot better. This entry was posted in Personal and tagged e-learning, education, postaweek2011, techonology. Bookmark the permalink.